Jan 25 : The second most commonly used word in the world of wine during the first decade of millennium seems to have been ‘China’, buzzing in every international wine forum. One of the BRIC countries, it thoroughly beat India in all aspects of wine, writes Subhash Arora who has held discussions with Chinese and other professionals on several occasions and at two most important international conferences of 2011-Winefuture Hong Kong and World Wine Symposium at Villa d’Este in Italy in November. Sitting on the dais and waiting my turn to speak about the wine market in India as one of the panelists in the Panel for emerging Asian markets at the WineFuture 2011 Hong Kong about wine marketing in Hong Kong, China, Japan and India, the words echoed in my ears as if they were from my Power Point Presentation. 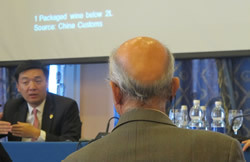 Yet the man behind the mike was Ian Ford, the founding partner of Summergate Fine Wines, a Chinese importing company. ‘We sold wines worth US $ 14.5 million over the week-end of November 5; the highest total for any single wine auction this year,’ roared John Kapon, CEO of Acker Merrall & Condit a day earlier at the same conference-an interesting aspect being that this was a Burgundy selection unlike most other previous auctions with most lots of Lafite and other Bordeaux fine wines. Fast forward a week. To World Wine Symposium where the speaker was Yi Wang, a Chinese investment banker living in Beijing, a member of Grand Jury Europeen and a connoisseur who was speaking on the evolution of Chinese market during the last decade. The house was full of audience that included Aubert de Villaine and Bill Harlan, respective owners of the iconic Domaine Romanée Conti (DRC) in Burgundy and Harlan Estate in Napa. Both are keen watchers of Chinese market and know that this market is very important for their wines which generally cost upwards of $1000 a bottle. Despite all the confusion and controversies in China and India, China has become one of the major markets for imported wines and many wine professionals believe that Bordeaux and California had much to be thankful to China for saving their industry last year. Hong Kong become a major hub in the East with the complete waiver of duties on wines in February 2008, improving the accessibility of wines to China. The auction market has reached a whopping billion dollar mark in less than a couple of years, with a majority of their wines supposedly bought on behalf of the Chinese buyers. Robert Joseph who founded International Wine Challenge in London in 1984 has studied the Indian market extensively for the last 5 years, is a disgruntled man. Very optimistic and earlier pinning high hopes on the growing Indian Market, he launched Indian Wine Challenge five years ago, around the same time as the Shanghai international Wine Challenge (SWIC). After struggling for three years, he decided to call it a day, unable to cross 400 wine samples. There have been no other competitions since. Even Steven Spurrier also gave up after one such competition. In comparison, SWIC had around 600 entries during the last edition. Buoyed by demand in Hong Kong due to the Chinese market, even the Hong Kong International Wines and Spirits (HKIWSC) clocked over 1700 entries last October. Robert who also produces affordable wines in South of France, has reportedly made a breakthrough in the Chinese market with the order of a few thousand cases. This number would be unimaginable in India today though he concedes that one day it might happen. The Chinese wine market had 23 million cases last year compared to 16.5 million cases in the previous year and is expected to be worth 50 million 9- liter cases within five years, and up to 100 million in 10 years. Skeptics may find the future growth estimates at the Wine Future a bit too optimistic but so far the growth has been explosive. Imported wines, account for 16% of the market and enjoyed 60% growth in volume in the last four years, according to Don St Pierre Jr, CEO of the Chinese importing company ASC Fine Wines. But the growth in the market for imported wine has been countered by a decrease in professionalism and wine distribution in China, said Don, resulting in an unprecedented rise in smuggled wine through Hong Kong and the increase in fake and counterfeit wine. Although the import taxes are considered around 48%, they also include the sales tax which is applicable to the domestic wines as well. What impact lower duties could make on wine imports in India may be estimated from what has happened in China. 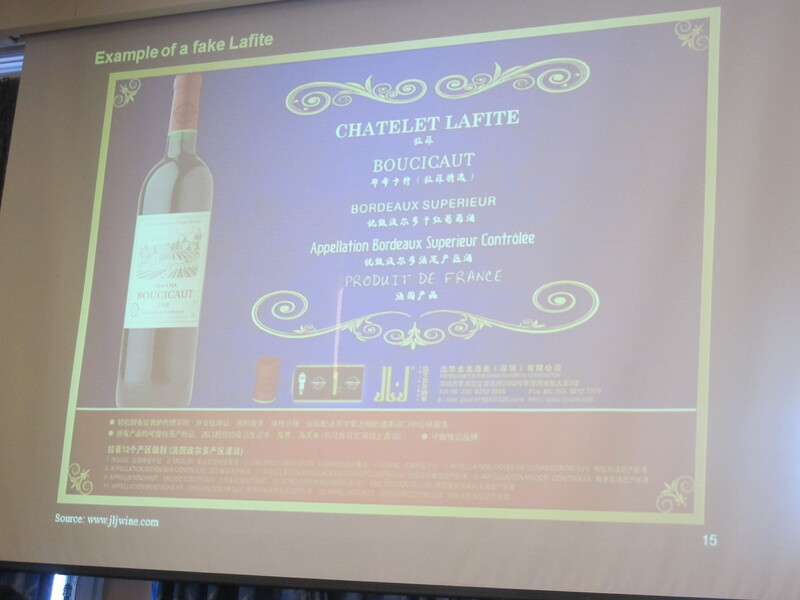 Jumping from 58 million liters in 2008, it went up to 91 million liters in 2009 and 148 million liters in 2010 according to the Customs sources quoted by Yi Wang at the World Wine Symposium. Interestingly, France continues to lead, still increasing the gap between other countries. The top 6 selling countries in China in descending order are France (46%), Australia (16%), Italy (8%), Chile (7%), Spain (6%), US (6%), followed by Argentina New Zealand, Portugal and South Africa. The French market accounts for 7.6 million 9 liter cases, according to St Pierre Jr. But the figures do not tell a complete story. Whereas France grew its share by a handsome 67% in 2009-10, Italy’s growth was higher at 79%, with Spain posting even a more impressive rate of 105%, and Chile (54%), and US (48%) keeping up the growth rate, Australia seemed to be under pressure with the growth at only 28%, indicating that the gains it had managed during the past few years are under threat, said Yi. Whereas India has yet to bag any Gold Medal in any international wine competition, China won its first Gold Medal at the Decanter Awards for Jia Bei Lan Cabernet blend 2009 produced by the He Lan Qing Xue winery. In a competition that only gives out 25 awards to the best among the 12,000 entries, the winery's win in the Red Bordeaux Varietal Over £10 in the International category is commendable and a proof that China is on the threshold of making a serious breakthrough in the global market for premium wines. There are a lot of wine lovers in China who are willing to spend some serious yuans ($1=6.33 yuans) on fine wines. 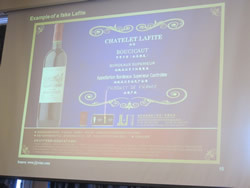 Bordeaux has long been the target of Chinese fine wine buyers because of the pedigree of these wines. To a great extent wine is still a status symbol-much more than in India. New World wineries -- especially in California and Australia -- recognize the growing demand for premium wines in China, and as such are spending more time in Asia to tap this market. Silver Heights and Grace Vineyards are two of the wineries that have won accolades from critics as producing excellent quality of international class. Recognizing their penchant for established expensive top end labels, Penfolds chose Shanghai to release its Bin 620, the rare 2008 vintage of Cabernet Shiraz blend made from Coonawarra grapes, made only in extremely rare vintages. Costing over $1,000 a bottle, almost twice the price of Penfolds Grange which is considered the iconic red wine of the estate owned by Treasury wines, it was last made in 1966. The decision to choose Shanghai a couple of months ago as the launching pad shows how important countries like Australia consider the Chinese market. For years delWine has been propagating that Indian producers should get wine introduced in a Bollywood movie and it would be a big boost to the Indian industry if a film or sports celebrity owned a winery or marketed a wine label. It is a positive sign for the industry that during the last couple of years, a few movies have already shown wine being served and drunk instead of VAT 69. But no celebrity has been passionate enough about wines to take a plunge and start producing wine. Consider if there were to be a Big B wine or perhaps a Tendulkar wine or a Dhoni. A ‘Dada’ might become the toast- of- town in Kolkata and wherever Dada Saurav Ganguli had his fans. For obvious reasons it could not be a Shahrukh, Salman Aamir or a Saif wine even if one of them were a wine connoisseur serious enough to want to enter wine industry. Former champion cricketer Kapil Dev loves wine but not enough to get into the wine business-he entered the lighting business instead. But today, Francis Coppola the well-known film directors of Hollywood is a very successful and well respected winemaker- he was the guest of honour at the WineFuture 2011 Hong Kong. A retired Chinese basketball player Yao Ming who retired from the NBA team Houston Rockets in the USA recently announced entry into the wine business. Yao Family Wines is sourcing a wine from Napa Valley in California with a Napa Valley Cabernet Sauvignon 2009 and selling it for $289!! Motivation for buying wine is different in China. It is not for enjoyment or an intellectual drink as in the old world but is bought mainly for business entertainment and gifting. But there has been a significant change in marketing wines during the last decade. For instance, whereas there was only Carrefour that had wines to sell in 2001, there were over a hundred wine shops in different format in Shanghai alone last year. Whereas only western restaurants had wine lists, today all classy restaurants including even the Chinese restaurants have impressive lists that keep on getting bigger, noted Yi Wang. It may have been a common site to see the Chinese drink their wine with coke a decade earlier but today such sights are rare. Against 3-4 wine importers in 2001, there are staggering thousands, the number of importers estimated to be as high as 20,000 with a majority of them being one-man shows. Whereas expats were the key drinkers 10 years earlier, today Chinese are taking keen interest in wine appreciation with demand for education exploding. Fongyee Walker, a Chinese Canadian educator who is in the final stages of earning her MW is based in Beijing. She says, ‘the demand for wine education has been exploding. We don’t even have to advertise our classes now – they just fill up quickly with people who are on the waiting list. There is a real shortage of Mandarin speaker wine trainers here and we cannot train people quickly enough.’ There is also growing number of sommeliers, mostly French- trained. The number of wine clubs has been increasing fast. The magazines-online and print have been exploding in numbers. A multi -million dollar Shanghai Wine Exchange has also been started, through which several important wine services may be channelized. Those words would aptly fit either of the two of the BRIC countries, Indian and China but there is no denying that the first decade of wine market expansion belonged to China with several factors working to the disadvantage of India. One hopes that we take some lessons from it and implement changes that would prop up India on the world scene and compete with China during the following decades.